As you can see by the photo we are all out of strawberry jam. The boys and I have tried to go pick berries twice to fix this problem and both times the fields were already picked out. Really it is early here for strawberries. In another week the plants will be overflowing with ripe fruit. However the boys and I love going berry picking and all of us are impatient for more jam, strawberry butter and mounds of strawberries to eat just waiting on the kitchen counter. So why am I posting this recipe before I can get enough strawberries to make it? Well many of you are already in the height of strawberry season and this is a great way to preserve their taste for the winter. Plus this recipe is on my mind right now, even though I don't have any for us to eat. This recipe is super easy to make, even for those with a fear of canning and traditional jam making. For other fruits I use traditional preserving methods and no commercial pectin. However I prefer the taste of strawberries when they are uncooked. This delicateness of flavor is why local seasonal strawberries are so different from their grocery store relatives. So when I make strawberry jam I use freezer jam pectin. It also means this is a super easy recipe that you won't mind making after picking a mound of berries. You don't need to hang over a boiling pot of jam and boiling water bath canner to make it. Good thing if I want to have the time, and energy to make at least 4 batches this summer. The resulting jam tastes like strawberries and summer. If you have only ever had strawberry jam from the store this will be a real surprise. I think store bought strawberry jam just tastes "red." The last time I said that Sebastian asked what I meant. I explained that it doesn't taste like strawberries, just like sugar and artificial strawberry flavor, it is what the color red would taste like. Then the boys and I went with Lewis on a business trip to Boston and at breakfast in the hotel Sebastian finally tasted regular strawberry jam. After taking a bite of his toast he said, "It tastes red, only sweet and red." He did think the bacon and cheddar omelette he had there was, "Spectacular." 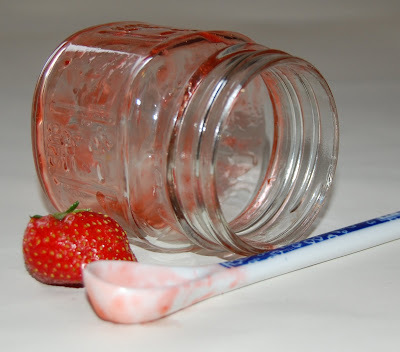 The recipe I use is based on a traditional no pectin strawberry jam I came up with several years ago. In that jam I added the chopped peel of half an orange to ensure the jam would set, as strawberries are low in natural pectin. The jam reliably set well and the orange was a wonderful counterpart to the berries. I didn't keep the peel in this recipe as it would not taste good uncooked, but there is Cointreau for the orange taste and Drambuie for complexity, both liqueurs can be left out if you prefer. 5 - 6 1/2 pint jars, it is fine to use regular glass canning jars. Ball does make freezer jars, however they still break if they fall when frozen. Perhaps I should stop over stuffing the freezer. Combine pectin and sugar in a large bowl and mix until thoroughly combined. Combine crushed fruit with liqueurs if using and either lemon or orange juice. Add fruit mixture to the sugar and pectin and stir for 3 minutes. Ladle jam into half pint canning jars or freezer jars leaving 3/4 of an inch of headspace to allow for expansion during freezing. Allow jars to stand at room temperature until thickened, approximately 30 minutes. I don't like this jam until 24 hours after making it as it takes that long for the sugar to dissolve properly. My boys love it right away as the undissolved sugar makes it much sweeter. The Ball package says freezer jam will keep for 1 year in the freezer and up to 3 weeks in the fridge, I often keep it for longer in the fridge without any problems, there is enough sugar to act as a preservative. I don't know if it will last a year in the freezer, I never seem to make enough for that to be a concern. *If you are worried about adding uncooked alcohol to the jam bear in mind that when you make a dish such as a stew with alcohol most of the alcohol is not cooked out. The alcohol content in this jam is actually very small, or you can just leave it out. I love the idea of using unripe strawberries or orange rinds to eliminate the need for commercial pectin, like your traditional recipe. This one has considerably less sugar, which is one of the reasons that I want to try it. How would you modify this recipe if you wanted to avoid commercial pectin? To modify this recipe so I could eliminate the use of commercial pectin I would use 25% (or so) under ripe berries as well as adding a tea ball or muslin bag that contained the seeds and chopped peel of the orange or lemon that was used for its juice. To retain more of that fresh strawberry taste mix the berries, sugar and juice with the bag/tea ball of seeds and peel in a non reactive pot or bowl. Allow that combination to sit in the fridge overnight. This is called macerating and it will release juice from the berries. The next day I would strain the juice from the berries and cook it with the bag/tea ball and the liqueurs, if using, until it reaches the gel stage. Then add the berries and cook for about 5 minutes more. I would then either process it in a water bath canner or freeze it in jars. (After removing the pits and peel of course). Freezing it will help the strawberries have less of a cooked flavor. Also, if you like the taste of the bits of peel you can chop them finely and just have them in the jam. I hope that helps and is understandable. Let me know if you need any clarification. lol Robin. Thanks so much. We picked about 4 lbs, so I'm attempting to do just as you suggested! I'l let you know how it turns out.